The Duke and Duchess of Cambridge shone a spotlight on World Mental Health Day at an event hosted by mental health charity Mind at London's Harrow College. Raising awareness in mental health is understood to be something both William and Kate feel passionate about tackling and the couple plan to undertake a number of engagements in this area, including a day of events in Scotland later this month, which will have a mental health theme. A royal source told People's Simon Perry: "There will be plenty more from both of them through the autumn over this issue. The couple feel there is a real momentum building and people are ready to talk about it. They are feeling energized about it." This year's World Mental Health Day theme in the UK is 'Dignity in Mental Health', and in the US the focus is on removing the stigma: 'I am Stigma Free'. 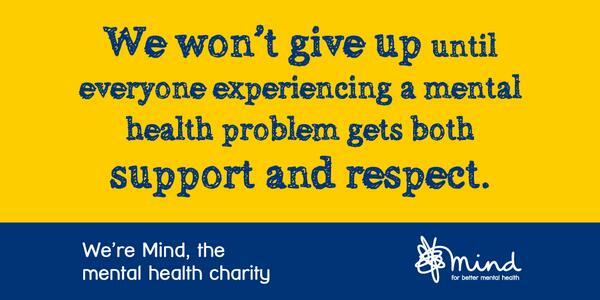 At Mind, they work to provide advice and support to empower anyone experiencing a mental health problem. They campaign to improve services, raise awareness and promote understanding. On their website they describe their goal perfectly: "We won't give up until everyone experiencing a mental health problem gets support and respect". The work of the charity has received support from celebrities and public figures, with actor Stephen Fry becoming Mind's president in September 2011. He has been very open about his own experience of bipolar disorder and as president promotes causes and advocates on the organisation's behalf. You can read his personal take on his website. Ambassadors of Mind include Tony Blair's former director of communications Alistair Campbell, comedian Ruby Wax, and popstar Frankie Bridge. A student who was delighted to meet the Duchess said "amazing to meet you". Kate commented the work she's doing is "amazing". In order to further their understanding of mental health issues the Cambridges met young people who have battled their own problems. They chatted with volunteers from Mind and the anti-stigma campaign Time to Change, which works to raise awareness about mental health with other young people. There is sadly still a fear of seeking help amongst many people and destigimatisation is very much the next step - something experts believe the involvement of high profile people such as the royals can help have an impact on. The couple saw workshops in action and met volunteers for the charity's Mindkit programme which is being delivered across London and educating young people about emotional health and resilience. 'Claudia Denington, a volunteer for MIND, told PEOPLE that the royal couple were "really down-to-earth. "Before they walked in it was really nerve wracking but as soon as they were sitting down it felt completely normal," she said. "I kept doing a double take! But they really put everyone at ease. They genuinely wanted to hear about our personal experiences." When someone thanked the couple for shining a light on mental health issues, Denington added: "Will said, 'Actually you guys are the real heroes and it's you that we want to hear from, it's not about us.' "
"They were so down to-earth and just normal people, like any other couple. They were really genuine and I was shocked at Will in particular at how much empathy he had. You could just tell in his face that he had been impacted, that he really felt for people." The Duke and Duchess laugh as Kate offers William the bouquet she was presented with. A lovely photo of the couple. 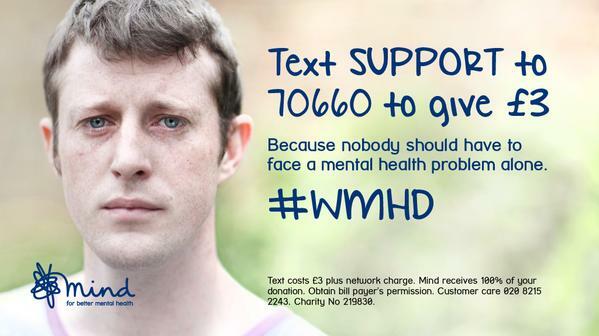 If you wish to donate to Mind please click here or alternatively for those in the UK text SUPPORT to 70660 to give £3. The Duchess wore her Tory Burch 'Paulina' dress - a garment she selected for a playdate with Prince George in New Zealand during the 2014 tour. I thought there was a very strong possibility Kate would opt to re-wear a piece that had been publicly seen before for today's event to ensure her sartorial choices didn't detract from the engagement. The Paulina Open-Knit Dress is from the designer's Resort 2014 Collection. 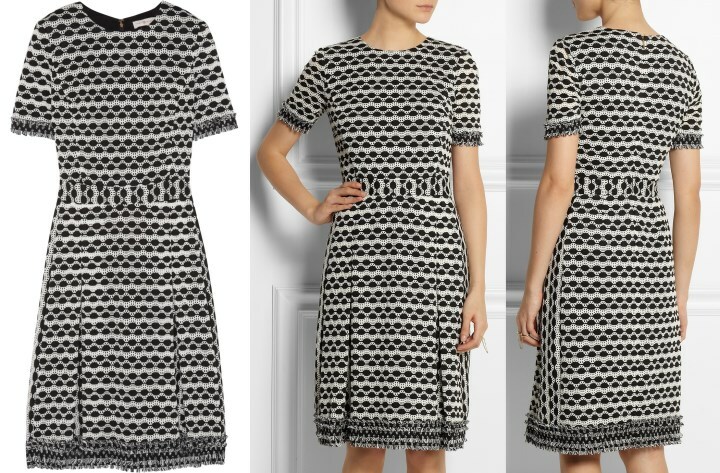 The €435 black and white print dress features a pleated skirt, a concealed zip fastening and delicate fringing. It is completely sold out and not expected to become available again. For those interested in emulating the look, the talented Kate's Closet shared an excellent Repli-Kate of the dress a few days ago. 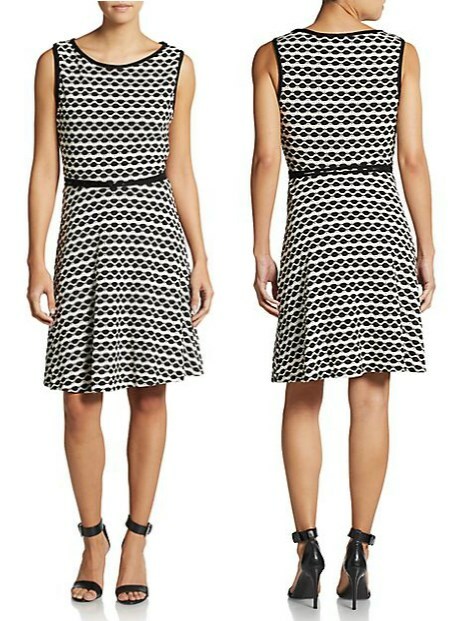 The Max Studio High Contrast Fit and Flare Dress is made from the same fabric as Kate's dress and it's currently reduced from $118 to $35 at Saks Off 5th. The Duchess wore her black suede Stuart Weitzman Power Pumps. And carried her black suede Mulberry clutch. There was some confusion regarding Kate's gorgeous new earrings. 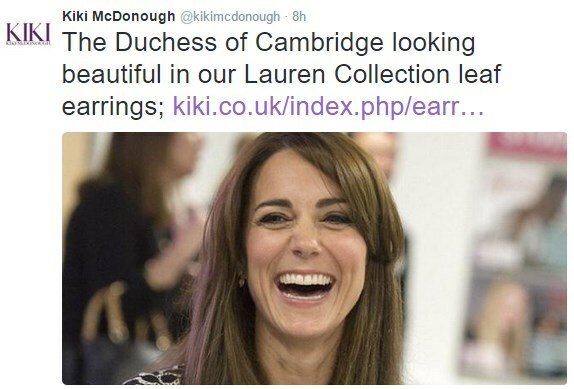 Kiki McDonough tweeted Kate wore the Lauren Leaf earrings today. 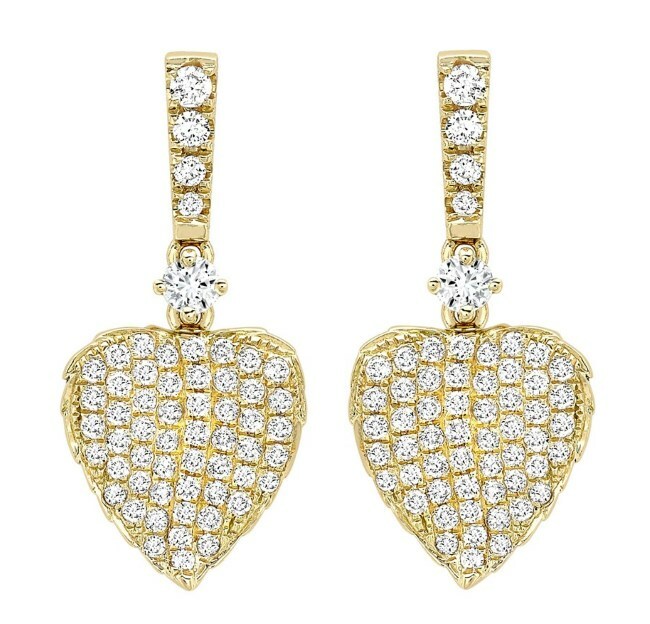 However, on closer inspection the wonderful Susan from What Kate Wore discovered they are in fact the very similar Lauren Yellow Gold Pave Diamond Leaf Earrings. The £2,200 earrings are described as "Beautiful and elegantly small these 18ct yellow gold and pave diamond leaf motif drop earrings are from our new Lauren Collection inspired by the British ballerina Lauren Cuthbertson." You can view a video from the event here. Onto more frivilous things. I love her in this dress!! Nice rewear!! :) Also, her hair is looking great! I'm a huge fan of her poofing/"teasing" the hair in the back like that. A bit 60s feel but not overdone. It suits her so well! At the same time Kate's choice in dress, does bring back images of Plunket Playgroup and their work with young Children's Health and Well Bring. I think Her choice was very intentional. Because ever time we talk about Kate's dress we are also going to be talking about Plunket and the work that they do. And that may have been something that we have forgotten about. There no coincident she wanted to draw a parallel between Mental Health and Children's health, as well as the Cambridge's being doting parents. William is wearing a similar outfit as Plunket as well today. If Kate wanted people to not talk about what she was wearing she would have worn something recents, like the dress fro HMP SEND. But she specifically pulled THIS dress out of her closet. And I agree it was probably for a reason. Her dresses become associated with different things or events. This dress very much has the same. this was one of the few times we actually got to see George in person and get a sense of his personality. 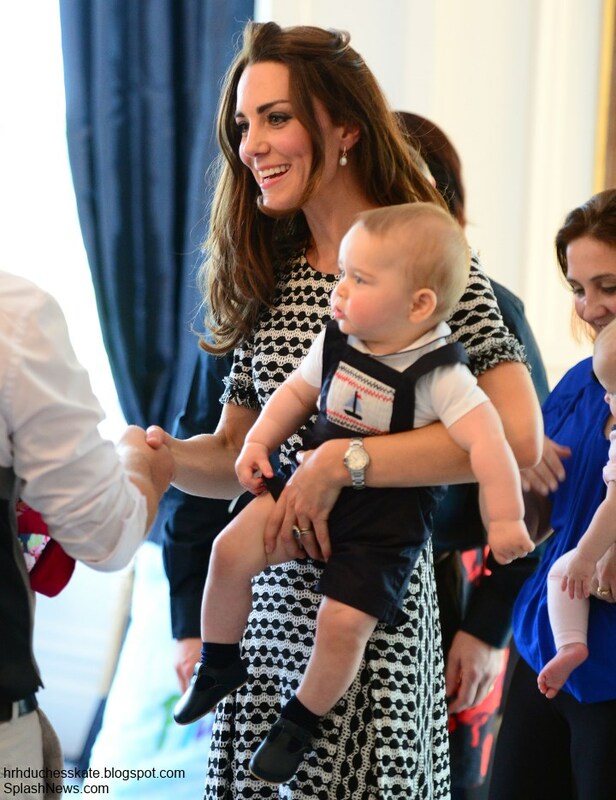 I agree that she and William wearing the very same thing that they wore to the Plunket Playgroup was no coincidence. Kate is a detail person like that. Wearing the peace sign green silk dress when the senior royals held the media get-together, wearing the polka dot dress to present George to the world reminiscent of Diana, wearing 2 feathers on her hat on the balcony for her 2 future Princes of Wales, the outfits for George that were almost Identical to ones William had worn, the resemblance of the photos she took of George and Catherine to the ones taken of Charles and Anne, the design of the crown molding of the wedding cake display room added to her wedding cake, the engagement photo identical to that of Charles and Diana, and so on. And that is why I think she is the perfect choice to also establish the Jewel Foundation. Her attention to historical, artistic detail can motivate her to gather and preserve the nations Royal Jewelry heritage. Didn't mean to digress or in any way minimize their efforts of today. Love this couple and the passion they have for raising the profile of often overlooked areas such as mental health. Do think she is looking really tired though. The dress is very nice but i think she looks tired and very very thing! No She is very lovely! Love that they are both supporting this issue of Mental Health, like it was said above, bringing high profile people into the picture helps to destigmatize the issue. Oh and I agree Charlotte that Kate probably wore this dress to brush aside the fashion drama and focus on the real job at hand. What a worthwhile cause to shine a light onto. There seems to be a heart-warming global movement of awareness regarding mental health at the moment. Let's not forget that William's mother also suffered with psychological problems - I have read that she had borderline personality disorder which is not surprising given her childhood with warring parents. Despite her personal suffering and internal pain she embraced so many causes during her lifetime with a unique understanding of others in distress. So much to take forward with her legacy. The borderline personality disorder was "diagnosed" by Penny Junor as a way to discredit her and build support for Charles. It is one of the crummiest and most wicked things Charles did to Diana's memory and legacy and for that reason alone should go down in history well-known for his pettiness, whatever his other qualities may be. Diana did not ever come out and say that she had any mental disease - except bulimia. She was a sad woman and probably depressed from time to time, certainly lonely. However, every single person who knew her and spoke of her talked about her indomitable spirit and her unbreakable optimism - qualities that are antithetical to mental illness. She fit the profile of a person who, despite difficult times would not fall prey to prolonged depression or disorders. She would fight it out and put one foot forward the other... things that people with chemically induced mental problems cannot sometimes do. No doctor was known to have ever diagnosed Diana with any mental disease. Her true disease, that she was public about was bulimia - but true to her spirit she fought that and overcame that. She did not let it take hold of her, bring her down and destroy her. Anon 20:21, well said. Penny Junor's "diagnosis" was a cruel attempt to discredit Diana and make Charles look like the victim in his marriage. The passive silence from Charles speaks volumes about the PR campaign waged on his behalf. Failed marriage or not, allowing this to be said about the MOTHER of his sons is telling. She also admitted to post partum depression. She mentioned that nobody in Charles' family had any psychological problems and didn't know what to do for her. They recommended the Queen' s doctor but she chose to see someone else. I don't think that was a long lasting problem as shown in her pictures and devotion to her children. Anon: 20:21, not a very helpful comment about people who have mental illness. Anyone can experience it, there's not a personality type that makes some people more prone to it than others. It's indiscriminate. Also, Diana was not a 'sad' woman. I think she had moments when she was upset, but also, times of great joy. Wasn't it Sally Bedell Smith who wrote the book saying she may have had borderline personality disorder? No question Penny Junor is in Charles' camp; she always was, but I don't think she was the first out with it although I cannot say as I haven't read her books. I have to agree, I think much of the claims about Diana has been put forth as a horrible smear campaign by supporters of Charles which I mention more about below - and Penny Junor has been one of the worst offenders. I no longer read her books for that reason. No matter what Diana may or may not have suffered from, and that shouldn't be important - the way this has been handled is exactly the opposite of what William and Kate are working towards - that mental difficulties aren't something shameful or negative - just part of human existance. As Rebecca pointed out. people can be positive and happy and still have issues to be addressed - I hope the involvement of William and Kate will go towards removing the old stereotypes and stigmas and the antiquated attitudes that Charles and his apologists have put forth. If Charles had been a loving and supportive husband, he would never have used any problems Diana had as an excuse for infidelity. The pressure he put Diana under as a young girl by having Camilla lurking in their marriage was appalling and would have upset anyone, particularly a young girl. It's a shame because I have respect for many of Charles' ideas but lost all respect for him - not for having a marriage break down - that can happen - but for the nasty way he has handled it over the years in an effort to promote Camilla. Kate looks really fresh in her dress and her hairstyle but at the same time her eyes are tired. I think William is more at ease. After all, it is she who comes under closer scrutiny. silver eyed, love hearing your thoughts and feelings but your photo (or whatever that is in blog lingo), I find unsettling. Kind of weirds me out, when I would rather be focusing more on content of what you are saying. I think it's very pretty and youthful and modest without crossing over into being frumpy. I love Tory Burch I own lots of clothes and bags from her! Hey Charlotte is William wearing the same shirt he wore as well that day in New Zealand? It looks very similar. I love the causes that the Duchess is taking on and which she and William is choosing to support as a couple. I think it is vital for their sanity that they don't just 'do charity because that's what's expected of them, but that the charity work they undertake aligns with their passions and compassions. I love that Kate recycled and I like the dress today as much as I liked it the first time she wore it. I did not quite like her bangs today. I know Kate's weight is a banned topic but I would like to point out that when Kate becomes too thin, her head with all the hair looks too big and makes her look top-heavy. I love that dress, and I'm so glad Kate wore it again. She does look thin, but I don't think she looks tired. A great event for both Kate and William. In US, Congressman Tim Murphy who also has a background in Psychology studies was giving an impassioned explanation on C-Span. Prince Harry might as well join them. Veterans who return after war have had, and continue to have serious PTSD/Post Traumatic Stress Disorder. The suicide rate among veterans is getting high in %. Fantastic cause. Wonderful dress. But the bangs. She's so pretty, I feel like they are just distracting. And I agree she looks tired, but with 2 little ones, I certainly can't fault her for that (but I will blame the bangs. They are NOT helping her). Have to agree about the bangs. My hair has a slight bit of curl to it and when I had bangs they looked fine after laboriously styling them in the morning, but stepping outside they would take on a life of their own. Generally poufing up which is what hers look like they're doing. Needless to say no more bangs for me. Wonder what Kate will do with hers? It is truly a great cause. Lets hope they follow this path, not just another PR stunt. I read they plan to go to Scotland too in October related to this cause. It would be so good to see Kate really going for this issue. Thank you Charlotte for the post! What a worthy cause to support. Mental health issues can cause enormous suffering - not only for the ones having them but also for the ones living and/or working together with them (including family and friends). Adults are able to search for their own way of coping, can offer support and encourage to seek help - children usually can´t. Mental health problems of their main care takers leave them confused, hurt and unfortunately, most often with the "coping mechanism" of blaming themselves. Stigmatising people with mental health problems as "being crazy", long waiting periods to get an appointment with a specialist, the often still uneasy reaction of other people when confronted with mental health issues - it makes a lot of people fear the consequences of seeking help. The consequences especially for children are often devastating. I speak from experience as my mother suffered from a very severe depression after her mother´s death. She left the illness untreated and our family unfortunately never recovered from the consequences of her many months in the darkness of her illness. The pain caused by her "strange" behaviour left us children thinking that we had really "lost" her as she was unable to respond to our needs, especially emotionally. I was very little at that time and had absolutely no-one to go to as the rest of the family was very much overwhelmed by the situation, too. It left me with a very deep feeling of being totally unwanted, sometimes even hated. The fact that no-one was ever allowed to talk about it made things a million times worse. Oh golly, those bangs aren't doing her any favors! Otherwise, the dress, shoes, purse all are perfection. The bangs have a "double curl" in them. Meaning they either need a trim or to let them grow out further and abandon the look. I don't really care for them on her. My favorite look for while on duty is half up half down. 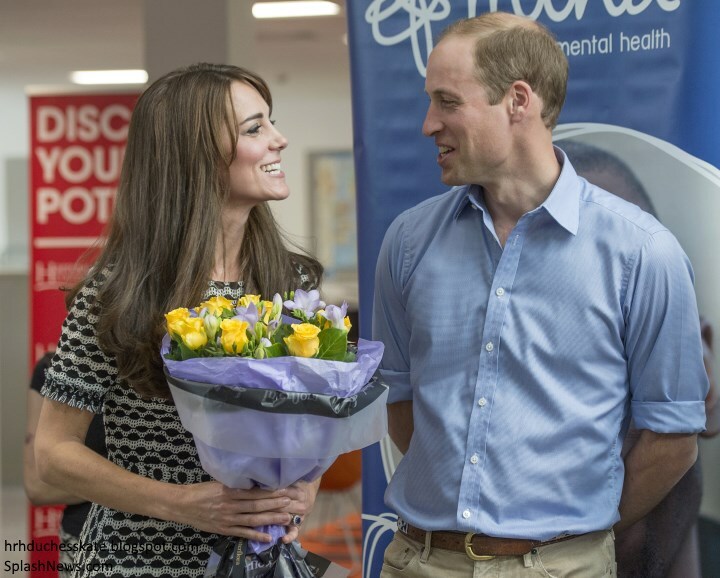 She and William are doing a great service to the mental health community. I know it may sound really old fashioned, but I would love to see Kate in an updated French twist sometime, or a classic (not muddled) chignon at the proper place at the nape of her neck, and a nice bun at the sort of top of her head like the younger girls are wearing them these days, and of course, some casual loose "buns" for more casual wear. The positioning to all of those would be key. I think sometimes the positioning of certain styles on her head have been off somewhat. I do give her an e for effort nonetheless, but her hairstylists can do better I think to showcase her beauty, not distract from it by getting those positions askew. No offense. Yes, I love the dress but still can't get used to the bangs! Did anyone else notice William's (new?) boots? Anon 18:38, I would like to see her try a chignon ot two as well. I think she could pull them off and it would change up her look entirely. I can't say enough about this worthy cause. Bravo to both of them. It is always a pleasure to see them together. They just have a natural and easy rapport with one another, and their love shines through. Love her dress. I wonder if she cut a few inches off her hair, it might brighten her face. I think this length is dragging her face down, perhaps adding to the tired look. Although, she still looks gorgeous. William and Kate have arrived for the Rugby match! Oh, I'm so excited! What is Kate wearing? Charlotte, do you have a twitter account so that we can get the latest pics and updates of Kate? I am so eager to see those new earrings on her. I love yellow gold and diamonds, (it's tough but someone has to, lol), and that design is so unique and in keeping with her love of the leaf design. Wonder if they were a gift for the birth of baby Charlotte. I think she looks great! I love the dress! In love her fringe, gringe and or bangs. They look very happy and totally at ease together and in love. As to being tired looking I think she is a very hands on Mother. Yes she has Nanny but Kate strikes me as someone who relishes being a Mom. With a newborn and the very active George she IS going to tired. In had 3 in diapers and while I loved the time I was exhausted and I looked tired.... but happy. I wish people would stop with the 'she looks tired ' ..... she should look tired as a Mom. If she looked crisp and spa done people would say 'must be nice to look so put together with two little ones... she has the Nanny'. She cannot win! She looks beautiful in my humble opinion. Picking up what Fiona said above, I think William and Kate embracing the issue of mental health and removing the stigma goes directly back to Diana. I always was so proud Diana had the courage to speak about issues that affected her directly - speaking out about eating disorders and taking Relate as a charity. I thought it showed tremendous courage on her part - and did an enormous amount to help people realise they could seek help without feeling ashamed. If a beautiful princess can suffer from problems and face marital difficulties, there is nothing for the rest of us to feel shame about. At the same time, I remember feeling so sad because some of Charles' friends- one in particular (I won't name names) - used Diana's problems as a reason why Charles shouldn't be blamed for the bad marriage and at the same time manage to put down mental illness by rubbishing Diana as a nut case who deserved to be binned.. That attitude still crops up in books by Charles supporters. He also dumped his old friend kanga when she suffered from problems as if he thought she would taint him. And I thought at the time, "you know, Charles, these issues you're letting your mates denigrate, happen to affect a large number of your future subjects as well. And husbands, parents and children, have family members and spouses with these problems and still manage to be supportive and stay the course." How much better it would be to see the Prince of Wales embrace mental health issues as a something not to be ashamed of or hidden away as happened to the Queen Mum's relatives, but something that can be brought into the light of day so people can seek the help they need without embarassment or fear. Well, it didn't happen with Charles but I'm delighted to see it being picked up by William and I hope he and Kate conttinue and expand their work in this area. I was just reading in the DM about the high level of depression the elderly face when they don't have close contact with their families - a particular interest of mine since I was lucky enough to keep my parents at home but I've seen so many lonely people in care homes. I would love to see William and Kate extend their interest to all ages. It is particularly hard for the older generations to admit difficulties and seek help - I remember losing friends of my mum's and nana's generation to breast cancer because they were too embarassed to seek medical help when they found a lump until it was too late. It's time's for these old barriers to be pushed aside and for issues of physical and mental health to be dealt with openly and honestly and I'm delighted to see a new generation of royals lead the way - just as supporting men and women in the services - no longer fasionable - and honouring their courage and embracing their issues including PTS is something for Harry to continue to take on. I've always loved Kate's dress and it was very appropriate here. Their "flower" moment was so special and both William and Kate deflecting admiration of them onto the people at the charity speaks volumes about the hearts of Willam and Kate, their wedding pledge for ultruistim in action. Has anyone else noticed how focused and alert George almost always is? Some infants and toddlers just sort of chill, and that's fine, but George, at the play date was very goal oriented and visually perusing his surrounding environment constantly, like he seems always to do. I agree. He looks very much to be a "Curious George" (Yes, I went there!) and very aware of his surroundings! Love this dress! Loved it when she debuted it and love it still!! Her hair looks - okay. She needs a new cut, some highlights or lighter tones and a new style. Not sure that all this seclusion and being a recluse in Norfolk is doing Kate a world of good - she looks much older than 33 and very worn and tired. I thought in many of these pictures, her smile looks forced - much, much different from her smiles the first time she wore this dress. And yes, we all know she's got two kids and two houses to look after. She's also got an army of servants at each home, staff to tend to other duties AND full-time childcare. Kate's still interesting but the bloom is off the "William and Kate" rose for me. I still wish they'd take on causes that have actually impacted their lives. I still fail to see how two aristocrats who have access to the best services, medical, mental health, etc., at their fingertips, can identify or understand those who are struggling with mental health issues. Yes, William experienced his mother's struggles with mental health (much of it caused by his father's family!) but he'll never speak publicly about that. His grandmother's family hid away the Queen Mother's two nieces, who were developmentally challenged (a different condition, somewhat, than mental illness). I rather expected Kate to maybe do something to bring awareness to morning sickness and her struggles with hyperemesis gravidarum or body image and weight issues. For a while, she was championing anti-bullying causes and spoke of her experiences with bullying. I expect if they weren't being so petulant and paranoid about being seen in public, I'd feel differently. But a sincere thank you to Charlotte for keeping up the blog. You are putting in a Herculean effort and doing a great job! I think your argument is a little off base. Mental health issues are mostly unseen and not talked about. 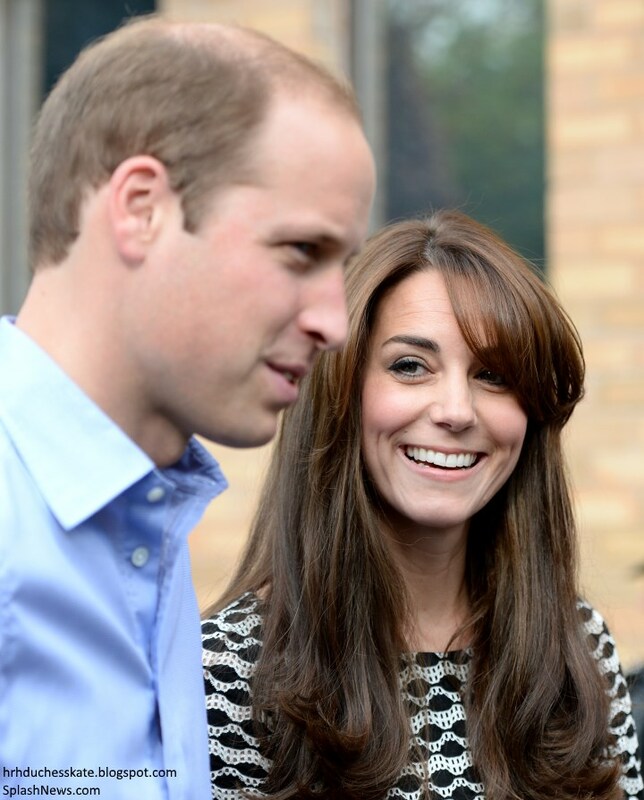 It is very possible that Kate or William, or both, have experienced bouts with anxiety or depression. Medication greatly helps, and the outside world sees no evidence that anything is wrong. I have experienced both, and it can be very debilitating. But you trudge thru it, and carry on even tho you may be dying inside. Even if that's not the case with the Cambridges, they certainly have the right to choose whatever cause that there is a need for. And there is certainly a need to bring attention to mental health. It is often swept under the rug and not treated until it's too late. Weight issues and body images....exactly why would Kate be expected to focus on that. Because some think she is too skinny and people are alarmed by that? And.. Michelle 0bama has already championed the childhood obesity issue, I don't think Kate should copycat that. How do we KNOW they are not patroning issues that relate to them. Alot of Kates charities have to do with confidence and belonging with kids. Since she was bullied, odds are that she herself has struggled with those issues. We know she had a head surgery as a kid. Who knows what that was about? Can that have to do with her hospice involvement? etc etc. I don't think they should have to tell their stories to all of us for it to be valid. And this sentence is just plain rude: I still fail to see how two aristocrats who have access to the best services, medical, mental health, etc., at their fingertips, can identify or understand those who are struggling with mental health issues. Ofc they can! The stigma around them is so great! I've seen comments about George because he's energetic that "Maybe he will be the first royal on Ritalin" and that Kate looks manic etc etc. Plus the general strictenss in the royal family can make it really hard for them to reach out. I know William and Harry have openly talked about the importaance of talking about their trouble and I sincerely hope they have been allowed themselves to talk to someone professionaly about what they've gone through. I think that it is great that they are bringing attention to this issue. With her reclusion and hiding out honestly I will take any issue they choose to highlight. I agree that she looks incredibly worn and tired. Whatever diet she is following is getting rid of the fat alright, but also making her looks ages older. I wish she would just stop with it. Not every royal takes causes that affect them directly personally or there would be many causes with no patron. The idea for royal family members is to take a cause that speaks to them in some way, so they are more than just a figurehead whether they have personal experience or not. Perhaps, William and Kate have had experience we don't know about it, perhaps it is due in part to Diana - I don't think she would mind William speaking of her difficulties - she was very open and a great believer in removing stigmas, so maybe some day he will say something personally. But many causes AIDS, leprosy, land mines that Diana took on didn't touch her life personally, and I would expect it to be true of charities of William and Kate. Charities needs royals - or in in their absence, celebrities or other prominent people to help bring attention to the cause and help with fund raising. 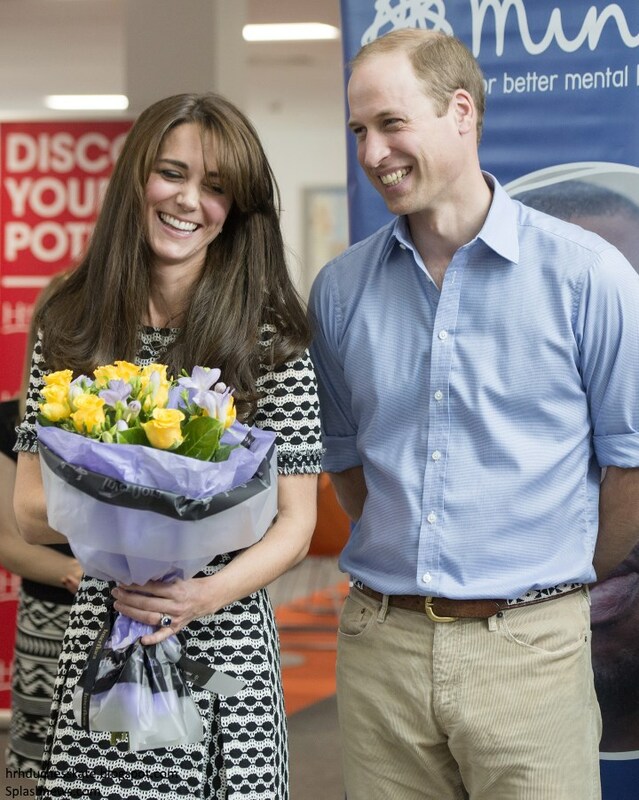 Royals especially often bring cheer to workers and those affected with problems and encourages volunteers. There will always be a dicotomy between patrons' situations and that of the people they meet - that goes without saying and is just the way it is, but most people are thrilled to meet a royal. Mental health is an area where a stigma lingers, especially with the young who are concerned with their peers or too young to understand there is help for how they are feeling, and the elderly who don't want a fuss made of them, and the attention William and Kate will bring to the cause will be a huge help. I too hope that Kate might take on charities relating to HG and childbirth although I once had brickbats thrown at me for saying so. But in light of the tragedy that just touched Becca and her family, and touched the hearts of us who know her through this blog, I will mention two fine charities that Diana was once patron of and where I would love to see Kate get involved. One is Tommy's (not sure who their patron currently is) which deals directly with the loss of babies and pregnancy issues. The other is the former Birthright (now Wellbeing of Women) which also touches on fertility and birth related issues. I believe Sarah Brown is their patron now but it would be an excellent one for Kate some day. For now, Kate hasn't had much time spent lately with the charities she is already patron of and making that up seems the first priority in my mind. I'm just glad to see her back to work with some more substantive duties than TV set visits and film premiers (not that I mind those for the sake of the gowns) and I hope that continues. doesn't work 24 hours a day. I lost 30 pounds when my first two were the age of the Cambridge children. relaxed and smiling. I'd have trouble smiling at times, listening to the stories they were hearing. Yes,xCharlotte has put forth great effort on her posts. But the comment section is back to status quo. It WAS a nice (short) break though. While it is always nice when a royal speaks to their own struggles on an issue they are championing, with all due respect Elizabeth, I don't think it's fair to ever expect someone to speak about those struggles just because they are supporting them. If someone is already having mental health issues, how is it fair to put even more pressure on them by making them talk about their own personal experience in regards to that? Good for Diana for talking about her own bulimia issues when helping with eating disorder intervention initiatives, but that requires a tremendous amount of bravery and strength that takes a long, long time to develop. And isn't always healthy at certain stages in life. And while royals do have access to the best medical care, etc., I'd argue that when it comes to mental health, they are not better off (and maybe even worse off) than the general population. As you yourself mentioned, Elizabeth, the royal family has a history of hiding away and avoiding family members with mental health problems. So I'm not sure how you can say they have the access to the best mental health services. Or rather, they may have access, but, the Windsor family has never seemed to be very supportive of using them. Also the reality is, as you have pointed out, that they are indeed very privileged. So if we expected them to only speak out on causes they have been affected by, then they (not everyone but many members of the royal family) would have very little to speak about. And it would mean that royal family members wouldn't be able to champion some of the most important issues that deserve their help the most. Interesting that this thread of discussion has come up today --- Camilla Tominey has an exclusive interview with Sophie Countess of Wessex in tomorrow (Sunday) Express that's online now. Sophie talks for the first time about her daughter Lady Louise and her struggles with sight, revealing that she was born with a severe squint (like many preemies) that needed corrected. That prompted her to get involved with worldwide efforts to support people with eyesight problems, and why she took the 4 day trip to Qatar to mark World Sight Day. So a very real example of how a personal connection with a cause can make a world of difference, when the cause hits close to home for the patron there is generally no end to the lengths they will go to for awareness and support. Many of Diana's causes that Julia mentioned did touch her life personally, because they touched the lives of people very close to her, which is why she was so effective with them. Of course, we can't expect that they only take causes that have some personal connection, as Maggie said that would be limiting. I think the point trying to be made was that they could have such an impact championing causes they've dealt with personally. But it took Sophie 11 years to speak about her daughter, so maybe in time! Also ---- I know I'm a new kid on the block, but Elizabeth had an opinion, whether we agree with it or not, can we all not jump on it and her? It was only one comment so I hardly think it cracks the status quo. From my perspective, Charlotte does a great job as gatekeeper here, the comment section usually has a healthy debate. In my mind it's the blogger who has to monitor comments closely before they're posted, and Charlotte seems to do that impeccably. We can correct a comment or debate it without making attacks. Elizabeth, it's two simple dots to connect which explain how "two aristocrats... can identify [with] or understand those who are struggling." Some intelligence combined with genuine empathy is all that's required. I recall a psychiatrist once saying that I must have experienced the same thing to understand it so completely. No. I hadn't. However I could put myself in that other person's place. I think William and Catherine can do that. It's one of their very obvious gifts. Lack of prejudice also helps understanding how they do it. "Two aristocrats?" What can you mean by that? Is a chance of birth or marriage some undesirable and debilitating condition that makes these two people somehow less than anyone else? While it is great that Kate is championing this very important issue I do wish she would provide the public with some soundbytes. DailyMail and Charlotte both have quotes from William. Kate apparently did ask some questions and said something to the tune of "keep giving us ideas" and another few trite sentences. I wish that she would come up with more interesting and insightful comments that the press could latch on and broadcast. That is how you actually publicize an issue. Just showing up is great, pictures on Daily Mail are also great, but to take it one step further one needs to have some words associated with the action. Words are powerful. I hope someone in Kate's office takes note of that and asks her to make some changes. Anon 22:16, I do agree. Gotta love it does sum it up. DIANA: "I want them [W&H] to have an understanding of people's emotions, people's insecurities, people's distress, and people's hopes and dreams." Diana admitted to postnatal depression and made the observation that showing emotions was not common within the royal family. She also struggled with bulimia, but that too was used as a label against her (within the Firm), rather than anyone there acknowledging the cause of it. Diana fan or not, that is a scary thought, no? And people question William's relationship with the Middleton's and his decision to marry Kate? Ha! Not sure where the mystery is...I'm sure Diana is looking down and smiling because he has been exposed to the unconditional love and support that they appear to represent. Anon at 22:16 - I don't think the comments about her looking tired or too thin are meant as criticism at all, but rather, I get a vibe of concern from 99% of those remarks (at least on this blog). And I think most of the people commenting recognize that she has reasons for looking tired. Claudia, I agree regarding Sophie but it need not have been the BP press office. A comment from her or Edward somewhere along the way would have worked just as well...perhaps even better. And hiding Louise away for so many years did not help. I do understand the desire to protect her, but it also contributed to misreporting and frustration she spoke of. Philly @00:51, your comment is sooo on the money!! Every bit of it. Well said! Elizabeth, I agree with you! Claudia, I do not see any personal attacks in this thread. I see one instance of quite justifiable questioning of unkind and probably inaccurate language. The rest of the comments discuss the issue at hand. This is typical of the debates here. Claudia, I don't disagree with you. I will just add this observation... IMO many of the decisions that Sophie and Edward have made over the years are more compatible with the Queen's generation. Maggie, 19:17- reasons for being tired and thin being the underlying point in question. Yes, everyone says there are reasons;the question is-which reasons? Some are not very kind and some not very accurate, I would imagine. Besides, who says she is actually tired and thin? Could be a matter of camera angles and lighting in some of the photos..
Tedi, I hate to admit it, but our Princess is growing up into motherhood and more maturity, and I think the time has come, and who likes that?, when Kate needs to lose about 3 to 4 inches of her maiden locks to continue to look young and fresh. Her hair, as luxuriously lush and healthy as it is, is weighing her down and making her look older than she is and tired. No woman likes to come to the point of starting that journey of losing hair length little by little as the years go by, but it needs to be done. Her hair will still look long and beautiful. I for one do not like to see women as they mature keep inappropriate hair lengths and styles. That negates staying in shape and beautiful (age appropriate) clothing. That is just my opinion, not meaning to offend. Some older women can get away with long hair kept in a chignon and look very classy and elegant, but they are the exception and not the rule. Kate could even start lightening the length little by little over a short amount of time. I wish she could keep all that length forever, but she can't. Hate to say it but I still have long hair - thanks in part to Mr Leo's passion for it. So do a number of my friends. I do think Kate looks a bit weary - I wonder if she didn't try to lose weight too quickly, but I won't dwell on that. It gets quite touchy whether we should mention weight or not although, I never felt right after not mentioning thinness with Diana - hiding such concerns didn't feel quite right either. It is hugely difficult with public figures - one doesn't want to help perpetrate a harmful lie but one doesn't want to gossip either. I will just say Kate looked rather tired today and there could be many reasons for that. I don't think long hair is automatically bad at a certain age - I think it depends on how someone looks. More importantly, I think that it depends on someone's role in life. Kate is not just William's wife or the mother of Charlotte and George - she is also a public figure. Realistically, I think she needs to take that into consideration when she makes choices about her hair. And even if she keeps the long hair, I just think the bangs need to go because they make all the negatives of the long hair even worse. She's not a college student anymore - she's a professional working woman whose appearance, like it or not, is important. I just don't think the hair in her eyes is a professional look. This could be easily solved by getting shorter bangs like her mother, or just pinning her bangs back when she's out for an official appearance. And Julia - I struggle with whether or not to mention weight too. I posted a while back about us avoiding the issue, but I think it's important not to mention weight gain more than it is not to mention weight loss. Some women are just naturally very skinny, but it's not generally "natural" for women to stay a certain weight in their early and mid-twenties and then get much skinnier in their thirties, as Kate has done. That does indicate a purposeful weight loss, and it may not hurt to say that perhaps she looks too skinny and could stand to gain some weight, both because it may take the pressure off of Kate to lose so much weight, and because it's important to demonstrate to young women who look to Kate as someone to emulate that they do not need to be so skinny in order to be loved or admired. But it's something I'm not entirely certain about. I don't want to target Kate because everyone is different, but generally I'm appalled by the modern emphasis with celebrities about how they got their figures back so soon after having a baby as if it is some type of competition for which you should get a prize. That is not rational or healthy or practical for a lot of women. I was vexed at all the nasty comments about Zara and her weight. Kate looks very nice but if she still had a few pounds on, she would have looked just as nice and I'm not sure the changes that Erika has mentioned, which I have to admit I've noticed too, may not come from trying to lose weight quickly after being pregnant. As Maggie and I have been mentioning, this is an awkward subject but because people like Kate are held up as examples to women in general, I don't think it is one that can be ignored completely. I don't want to say it is wrong for Kate to lose weight. Public figures are mindful that the camera adds pounds and can be sensitive about their appearance, but they also have many resources the average woman doesn't have. Some women lose weight from chasing active toddlers or breast-feeding but many don't. Looking at Kate over the years from St. Andrew's on - I would say she has done a lot of dieting and is probably below what her natural weight would be if she wasn't in the public eye. She simply is much thinner than in her university years. That's her choice but it doesn't mean it's something for others to emulate. Then, so should Kate, in clothing. hair, make-up, choice and frequencies of activities, etc. I really like those earrings. I am considering (rationalizing) buying those. They are beautiful. Given the time difference , this post is a fantastic read on a Sunday morning. Kate and Wills wore outfits that don't detract from the event, because mental health is what we should all be talking about. I think that focusing on youth mental health is a smart idea because stats tell us that 1 in 4 (or 5 depending on where you live) youths will have a mental health issue in their lives. And that's just the reported cases. The stats for youth suicide in some countries is much higher than for adults. If we can raise awareness and reduce stigma in young people, then hopefully they will become adults who won't deal with a mental health issue, or know how to look after themselves without being embarrassed. Here in Australia the ABC tv channel (different to US abc) has been showing documentaries every night this past week for mental health week, culminating in a variety show/telethon for mental health. Celebrities from all tv channels and other fields came together and donated their time to raise much needed awareness and funds. In a way, this is what W&K have done, just without the larrikin spirit of an aussie tv show ;-). They are using their status to discuss a topic that has been hidden for too long. They may or may not have had personal experience. That doesn't matter. What matters is that we are trting to create a different future. Who wouldn't look tired with two kids under the age of 3. Also, I think it is very important that she focus on the kids in these formative years. We will survive without daily events / blogs to comment on. However, if you are suffering withdrawal then I suggest you check out Anna's blog about the Countess of Wessex's. Another positive suggestion. Thanks 21:12. I agree in general with what you're saying, but I'd just like to say that someone can focus on the kids and have daily events to attend. I'm not saying Kate HAS to, just that I don't ever like the implication that one trades off with the other in the case of child-rearing and working, and I feel as though many make that implication on this blog. I agree Rebecca, people should not be confined to certain age related styles. That's an old fashioned notion. Today, people age differently, they are looking younger, longer. Good taste, and common sense should rule. I truly believe that William was a support to his beloved Mother, and has a deep understanding of mental health issues. It does not follow, that if you are rich, and have access to the best care, you are incapable of understanding mental health issues. Both William and Kate appear to have great empathy, and I applaud them for reaching out on their various issues. This is a wonderful cause and I'm glad that W&K have embraced it. I thought the dress hit the right note; not informal, but not too dressy. And she does look tired, but the length of her hair doesn't help. A shorter style would give her a lift. and maybe a brighter lipstick? I feel like these barely there shades she is wearing now are making her look washed out, especially with a black and white clothing palwtte. I have a question I would be curious to hear everyone's take on. I've noticed people praising Kate's increased involvement in mental health charities and commending her for raising awareness of this oft-stigmatized set of illnesses. However, in the handful of engagements she's done so far this fall, my impression has been that she has pretty much just visited the organization and been photographed as she meets people . . . although I suppose with the prison visit the palace later released a brief statement from her (or her team). For people who have followed royals in the past or who may pay more attention to the less-covered royals (Sophie, Anne, etc), is this typical? Is visiting an organization typically the main way a royal "brings awareness" to a topic? I was expecting, based on the hype, that she would be doing things like speaking to a reporter about what she had learned, giving a speech, meeting with political leaders, launching some sort of initiative, etc - these are the sorts of things William and Harry, for example, do when they're trying to bring awareness/funds to one of their causes, like conservation or the Invictus Games. Am I wrong to compare her work to William's and Harry's? I know William and Harry were born into the role, so to speak, so maybe that's a definitive difference, but I feel like Sophie's (under-publicized!) work is slightly more active than Kate's "visit an organization to learn about what they do" type of engagements. But again, it's not like I've undertaken some empirical analysis to compare the two, so I'm very curious as to whether others think my expectations are just unrealistic. I am not a long-time follower of the BRF and cannot comment on which approach to raising awareness is ‘normal’, ie that taken by Princess William and Harry or that taken by the Duchess. However, it is my impression that the Duchess’ approach succeeds admirably in raising awareness. I would guess that her name sells more newspapers than even her husband’s name (I may be wrong of course). The newspapers will gobble up the opportunity to cover her visit and the paper will be sold – not to mention the internet coverage. Thus, millions of people are made aware of the issue. About interviews after the visit(s), I believe that the hosting organization is by far more qualified and certainly more prepared to answer questions and I would hope that serious reporters avail themselves of the opportunity to get the pertinent information and incorporate it into the media coverage. Win, win! IMHO, the conservation and invictus game initiatives of Princes William and Harry cannot be compared to the Duchess’ raising awareness here. In a way, these initiatives generate new avenues –and at least in the case of the invictus games in a new area. Organizations addressing mental health issues are available so the problem is not creating a new avenue but to de-stigmatize the existing clinics and organizations and to start a discussion and educate about the resources. It is sad that the work undertaken by the Countess of Wessex and her efforts are under-publicized especially since she covers more and equally worthy causes. I’d blame this on the power of the media – they just haven’t quite picked up on the fact that the name ‘Sophie, Countess of Wessex’ sells papers as well. The Countess has by far more patronages than the Duchess. I tend to believe (I have no hard info on this) the number of patronages taken on by the members of the BRF is strictly controlled to ensure that the patronage continues on even if the initial patron can no longer fulfil the function. That is, the patronage is transferred to another member of the BRF rather than ceasing to exist. If that is the case it would seem to be prudent to limit the number of new patronages taken over by the Duchess and – with that in mind – focus on raising awareness in the manner she is doing: by visiting institutions and organizations addressing issues that need better awareness in the public mind. patronages now, especially while her children are babies. I am so verry happy that will and kate are supporting mental health, 15 years ago i found out that i was bipolor and back then people labeled me as crazy,bipolor is a imblance in the brain its a desise just like if you had diabetes i thank god for people like will and kate and for thier compassion and understanding you can tell they really care about this issue.today people no longer label people like me as crazy and i am truely greatful for the people who support us. As for her dress and hair i find unimporant in todays issue. Thank you charlotte for a great post. Unfortunately, the fringe is getting in the duchess 's eyes and hiding her beautiful face. As a person in a public position, a leader, she should have her hair out of way, this will help her come across as more open and sincere. The dress is fantastic and so is her figure. D.
As far as I know only a handful of reporters were there including Roya Nikkhah and Nina Massey, a general reporter for the Press Association. Photos from inside the event were very slow coming through. I believe Arthur Edwards took them and it took quite a while to distribute them to various photo agencies. "So that'll be last 5 jobs and counting with William, Kate and Harry with almost no media allowed. 2x Harry, 2x Kate, 1 William & Harry." I'm not sure what the Palace strategy is regarding this or the reasons why. It doesn't apply to all engagements, but certainly it's becoming more frequent. Ohh... I didn't notice that... I wonder if they are taking a stance? Or... I think I've seen them not reporting on a few events before... can it have something to do with it being a Saturday? Well, I have no idea which two events of Harry’s Mark’s referring to so can’t comment on those. Kate’s two events were visit to a prison (completely understandable why it was limited access) and a mental health charity dealing with children (again, I would think this makes it quite delicate with a large number of reporters and particularly a lot of photographers showing cameras in their faces). Is the William & Harry event the TV show? I believe it’s produced by BBC, so perhaps there was an agreement with BBC that they will have exclusive rights to it for advertising and boosting ratings for the show? Just speculating here, but as far as I know Harry hasn't had any issues with reporters recently, so can't imagine why he'd be limiting access. Thank you Charlotte, for explaining! And Sofy - Kate has done appearances at children's hospices with plenty of media, and that is probably even more delicate than a mental health charity dealing with children. Very interesting that they are limiting media. I don't like it at all. It lets KP completely control the narrative and exactly what is said or seen about an event, which bothers me. And it isn't going to help endear them to the regular reporters, and it seems as though they could use some endearing. I don't agree that a hospice is more sensitive than a mental health facility. Mental health patients can get really disrupted by to much hullaballoo around them. And also, alot of the times Kate has been at hospices she has met some kids in front of the camera but also had time put aside where she goes in and visits families and the sick children without the cameras. So even if the events have been very publicised she has still had time without the cameras or with just photos released by the charity or one PA photographer. Ok, I'm going to ask a question and I'm not being catty or malicious in any way. Everyone on here knows I am a big Kate fan and that I think she is wonderful. Look at the pictures of this event and then the one in Australia. Why does she look so different. Honestly, I can't put my finger on it. It was only two years ago, so time is not a factor. She is about the same weight, I think. Is it simply due to a different hairstyle and makeup? I really don't know what is changing how she looks so much and wondering if anyone else has soon insight. I guess it could be that she is tired but in many pictures, she doesn't look that fatigued. Hello Rebecca: don't know if you can help me at all, please. I have a close friend who has suffered from panic attacks for a very long time. Beta blockers didn't help. They decided not to see a psychiatrist, though they were referred by their doctor. I have bought them a number of books, but they haven't helped, either. I have heard that 'cognitive behavioural therapy' can sometimes help. Any advice, please? Hi Liz, I have a little bit of insight into this as my best friend from college has had a rather severe panic disorder since the birth of her first child. She wanted to go the behavioral modification route but found it was very difficult to do when she was having a full blown attack. It took a lot of work and wasn't all that succesful. Eventually, she experimented with several antidepressants and found one that lessened the severity and frequency of her attacks. She leads a pretty active normal life now. Also, she found that she has to excercise on a regular basis and eat clean ( no sugar, no white carbs, no additives, no caffeine) to fell optimal. I realize that panic attacks are a real issue so what I'm going to say is not to miminalize that but there could be an underlying medical condition mimicking panic disorder as well. If your friend is a woman in her twenties and thirties a thyroid scan might be something to look into. For fifteen years I was told I was having panic attacks but they were actually thyroid storms. I live in a metropolitan area with top doctors and hospitals but nobody could figure it out. It was a frustrating time because I was not responding to the psychiatric treatment. Finally, when I was diagnosed with thyroid cancer and had it completely removed, the attacks stopped all together. This probably has no bearing on your friend's situation but just throwing it out there because that might help someone somewhere. All I know is the oldest trick in the Hollywood book, is change your hairstyle/color when you've done something to your appearance because people think it's the hair. That being said, I've got no idea what she could have had done, but I too think she looks a bit different. I would put in a vote for seeing a therapist - gently as Rebecca puts it - because you want to respect their decisions and not add to the guilt- but I feel I must put in a word for it. I have a severe phobia about flight that was interferring with me travelling and I thought I owed it to Mr Leo who is not at all fearful to try to work with it, so flying with me wouldn't be so trying. I understand the guilt because people who aren't phobic find phobias quite puzzling and don't understand why you can't be rational - while people who do suffer are much more understanding that it isn't so simple. So that's it - I joined a therapy group that included people who were suffering from anxiety and panic attacks and I noticed they found it very helpful as we explored a number of techniques, including the dreaded exposure which I had to face up to, but am glad I did. Quite a few of those in the group were using medication but needed something more. This is the message William and Kate are trying to get through - don't be afraid to try to get help. Otherwise, the only other suggestions I have is Rescue Remedy which I find helpful but which is very tame I;m sure compared to beta blockers. (I call it my "flower power" since it is flower based and I'm a child of the seventies and Abba - especially their "My Last Summer".) But I always use it on travel now and mentally it gives me a feeling of confidence. You can find it at any chemist or pharmacy and it might help anyone here who has a phobia. I think that Kate's face is thinner - that seems to be the main difference. She is still spectacularly beautiful, but I confess that I prefer her with more cheeks and a fuller face. She seems to like the thinner look. Some of the thinning out of the face happens with age and often it coincides with delivering babies and the sleepless nights that follow. @Liz- buy a book called "FromPanic to Power" by Lucinda Bassett. I suffered for years with these awful things and no longer do. This book was the beginning for me. Everyone has their own journey with them and their causes but they are manageable and toucan live a happy healthy life. By the way, I watched a video the BBC posted, (The Duke and Duchess of Cambridge mark World Mental Health Day) and they both look marvelous in it. They were very engaged with event coordinators, and Kate didn't look tired. She was animated, beautiful and young looking. Still pictures can be deceiving, but seeing them moving about told an entirely different tale. So unless an engagement is announced at the last minute or after the fact, it seems like between September 26 and October 26, Kate will have done exactly one appearance related to mental health, or really any charity at all. As far as I'm concerned, if we want to call her "break" from work "maternity leave", then it's only fair to say that she is still on maternity leave. I don't blame anyone for wanting to be a stay at home mother, I walked away from a successful career with my first pregnancy and never looked back. But if that's what Kate wants she probably married the wrong man. Marrying into the monarchy is a tricky proposition, you have to accept you'll be one half of a working partnership. I don't know how long the British public will tolerate a rather absent high ranking royal, and when the public mood changes it changes quite suddenly. Even one morning a week is an incredibly light work schedule, but it would go a long way with this growing problem. Many thanks, ladies, for your help and suggestions, much appreciated! My friend's fear of having a panic attack hugely impacts on their ability to travel: they decided a few years ago that they would not travel more than 2 miles from their home as they thought it would lesson the chance of them having a panic attack......it's very difficult. I hope your friend does decide to get help but it must be her decision. I just know from my phobia that there is a desperate urge to avoid situations where you have to face the fear - I'm certain there is some fancy name for it but I just called it avoidance and I could rationalise that we could take marvellous holidays where no plane was involved. Working with the group was particularly helpful to me as you can feel you are very much alone with your fears and hearing others speak of their difficulties and the tiny steps we were all trying to take - whether it was to step out of the house or drive to one exit on the motorway, was very helpful - and the therapist was a lovely and patient man. I think it is very important that people not be embarrassed and we are able to speak of these things - what William and Kate are part of. I shall have to face it later this year at Christmas. I have always been better with the bigger jets - the bigger the better has always been my silly reasoning but we have a flight that will involve a smaller computer plane and I'm dreading it, but I will do it. And always when I'm about to fly, there are huge headlines about plane crashes. It never fails! Thanks for your help and for sharing, Julia. All the best with the plane travel.